Draper offers the largest selection of paper pad, writing surface, poster and decorative display easels in the world. 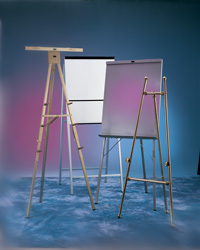 Draper Easels stand rock-solid on legs that fold easily for transport or storage. Numerous exclusive features including pen tray to ensure effective, trouble-free visual presentations time after time. Easels for every situation. Careful attention to quality, function, and appearance is what you expect and what you get from Draper easels.